Sunniness and cloudiness were intermittent throughout the day today for Northern Utah, but a dramatic change is coming toward the middle of the week. Further increasing cloudiness is expected tomorrow ahead of what could be a pretty good deluge of rain and snow for the Wasatch Front and Wasatch Mountains from Wednesday through the early part of the weekend. We can thank the large scale atmospheric setup for the goods we will be receiving later this week, as we have had a low pressure system trekking across the Pacific over the last few days. 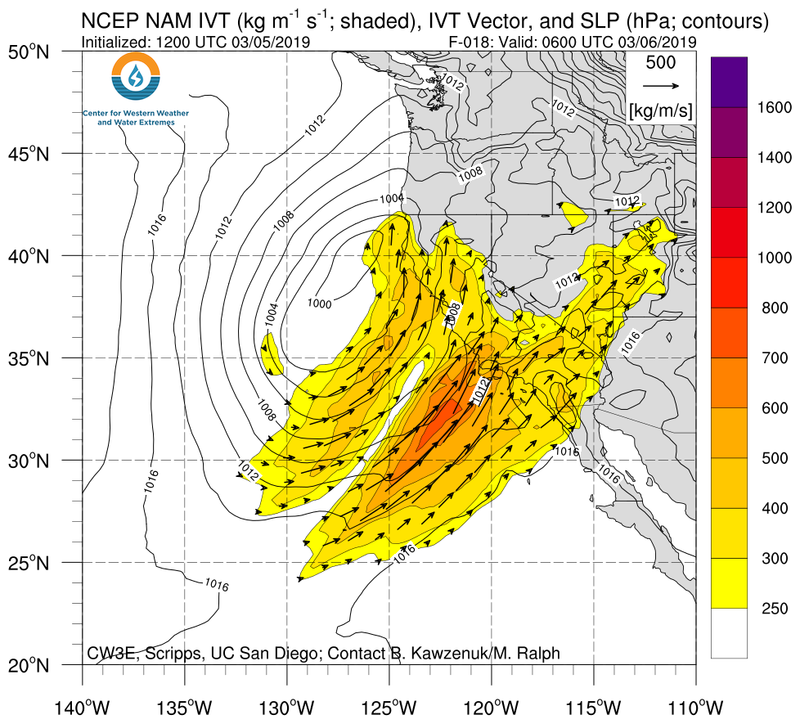 Its southerly track over the last couple of days and the next 24 hours have allowed and will continue to allow a moisture tap from warmer tropical waters as it landfalls on the western United States near the San Francisco Bay Area. This setup is conducive for ejecting moisture into the Intermountain West since the flow doesn’t have to cross the highest region of the Sierra Nevada (which causes a strong rain shadow for the Great Basin), and can instead flow more freely by the lower-elevation southern Sierra Nevada. Check out the simple cross section from Google Earth demonstrating this below. 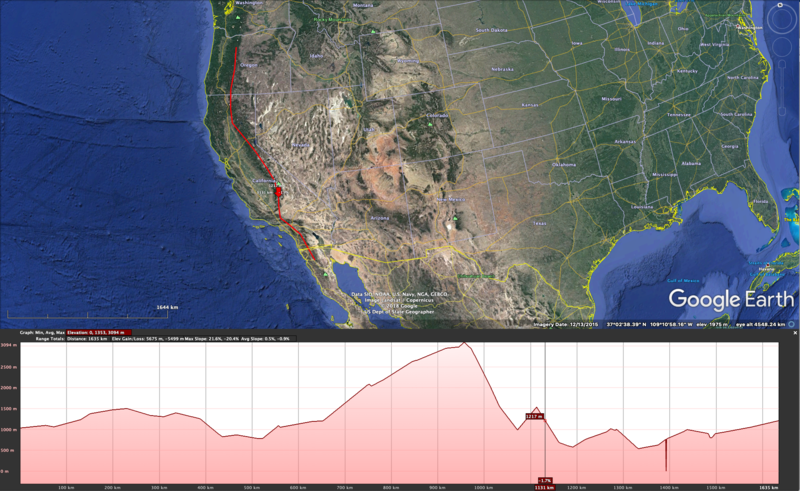 Google Earth transect (red) of western US mountain ranges and land elevations (lower panel). The red arrow shows one of the favorable lower elevation areas south of the Sierra Nevada that allows for moisture to penetrate into the Intermountain West. This is the situation we will see for the middle of the week. Tomorrow will be a day of increasing winds and clouds as we prepare for the next round winter weather for the Wasatch. The following 18Z NAM Time-height section below shows us what we get to look forward to later this week, with moistening of the atmosphere with southwesterly flow in the middle of the week. Time-height section from 18Z NAM (at weather.utah.edu) shows increasing winds throughout the day Tuesday and Wednesday transporting moist air into our region. As a result, we will see valley rain and mountain snow for the middle of the week. To really drive home that point, here is a NAM model run similar to above, but now looking at integrated vapor transport (IVT), which is a function of water vapor in the atmospheric column and wind speed/direction. It’s clear to see moist air flooding into Utah and toward the Wasatch off the southern tip of the Sierra Nevada as highlighted in the Google Maps transect. As always, this is subject to change over the next few model runs and locally higher amounts are possible. With snow levels near 7000′ or expected, some areas are subject to rain/snow mix at their bases and snowfall totals will be highly dependent on elevation/temperature. Check in with us for better details in tomorrow’s forecast. Better yet, it’s not over after the middle of the week! Another colder storm looks to be headed toward us for Friday! Next Next post: Four Straight Days of Snow!